Nowadays, websites are not just for sharing information about a company: from simply spreading word function websites now should call the visitors to action. For this function static websites are not working, to convince your visitor to buy something, register, share, like, etc. the website should be alive and interactive. In this post I just want to advise handful plugins that will add extra breath to your website. But before passing to plugins there are 2 things to consider for an effective user experience: the website should be 100% mobile friendly and speedy. If you fail in these 2 points then there is nothing to talk about an alive website. I’m simply in love with those service providing websites which have live chat, but responsive live chat. If you don’t have enough resources, then it’s better not to have it at all. LiveChat is a premium chat plugin with a lot of features. First of all it is fully customizable for matching your website’s design. There are handful chat window themes with an ability of CSS customization. You can also add company logo and social media icons. Among other advanced features I’ll just number a few ones that make it stand out: integration with Facebook, MailChimp, Dropbox, Google Analytics and more, chat and ticket reports, statistics and much more. It has a free trial for 30 days without requiring your credit card info, so just worth to try and discover all the features. It is listed under "WordPress" > "WordPress Plugins". The name of the author is LiveChat. 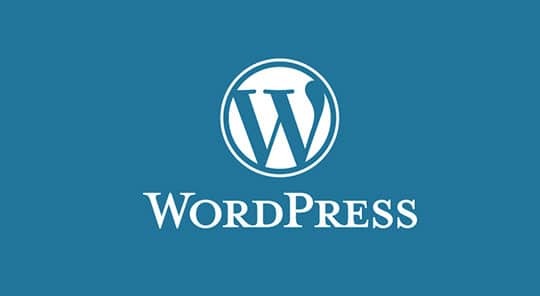 The name of the publisher is WordPress Plugin Repository. It was first get published on March 10, 2010. On February 28, 2019, it was last get upgraded. Tags: Live Chat Plugin, Live Chat, Chat Plugin, WordPress Chat, Wordpress Live Chat. Yes, smart sliders can make your website engaging. But for this just huge photos are not enough, you should have something to play around, to give fun. I’m sure that you follow modern design trends and most probably have seen those websites which use mouse click or hover to animate elements or properties of the page. This is called parallax effect. Another tendency is having a video to play in the background of the slider and just a few huge words overlaid on the video. These 2 are my favorite trends for this year with the help of them you can achieve better conversion rate and most importantly your visitors will have the feeling that your website is alive. Other good ideas that you can implement with Slider WD is having zoom in and zoom out effects. If you want to share some text on the slider but without having all the text on it, you can create hidden text layers on the slider and display them with hotspots. What are hotspots? These are just active spots on the slider hovering on which text layer appears. 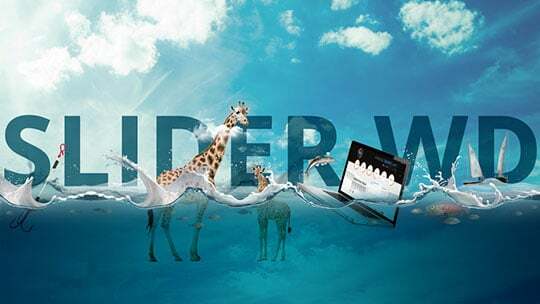 You can see all these interactive slider features live on the Slider WD demo page. It is listed under "WordPress" > "WordPress Plugins". It is developed by 10Web. It is available at WordPress Plugin Repository. It was first get available on October 14, 2014. It was last get updated on April 16, 2019. 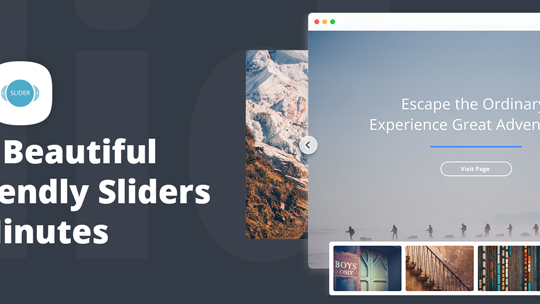 Tags: Responsive Slider, Wordpress Slider, Slideshow, Image Slider, Slider. If your company usually organizes or participates in events, then it’ll be a great idea to engage your customers by adding countdown timer. It can be right in your home page just for attracting visitors’ attention. No one can stand indifferent seeing the timer because it usually means that something special is coming soon. There are so many countdown plugins and widgets that I just don’t want to underline one. It has very basic functionality, so while choosing one, just be attentive to have one which matches your website design. What can make the website more active than social media integration? I have really spent a lot of time trying to find the best social media plugin worth to advice but seems like the industry needs a new, really advanced social media plugin. There is a lot that people can do with integrating social media to their websites, so just standard options are not enough. However, I think that Monarch Social Sharing Plugin by Elegant Themes is something really worth to try. First of all unlike other social media plugins which work only with social media giants Monarch gives you freedom to share and follow in 40 social networks. It also has that amazing elegant design that this company usually offers for all its products and you can choose button shapes, colors and hover effects. Mostly I like their fully customizable sharing pop-up and sharing fly-in. In both cases you can fully control when and how they should be displayed. You can place the buttons on all widget areas or display with short-code. So, to make the website alive, you really need some plugins that will be interactive, engaging and calling to actions or will bring some extra fun. This article is written by Zhanna K. She is a blogger and technical support specialist for around 5 years. Every day she work with dozens of WordPress and Joomla users. Her latest blogs are all about website design and development hoping to help people have less unanswered questions in website development process. Is it listed in WordPress plugin repository?